Investment opportunity: Rental investment highly profitable, you don't have to do anything, a rental service is available to give you a quick return on investment even though you do not (taxable at source). Up to 5% depending on the type of accommodation **. Description : This Domain opened in July 2013. The concept, unique in Grand Baie, luxurious apartments with a 5 star hotel service, was rewarded “Best Property Development” by professional judges of all around the world. The site, in a charming environment in the heart of nature, concentrating around small straw kiosk gathering one spa, a restaurant on water, a lounge bar and a fitness room. If you are searching for real estate investment trust, quickly returned on investment, the property developer branch can look after the rental of the good. - The availability of a private beach entirely at “trou aux biches” attainable with a daily shuttle : kiosks, deck-chairs, waterfront massage and water sports are available. Strong aspects: An exceptional destination in one of the most beautiful places on the planet. A premium destination of International tourist that ensures a rapid return on investment. The promoter is a leader in Mauritius and recognized for its reliability and sturdiness. Alizées field is a concept completely original and innovative. Investment opportunity: Rental investment highly profitable, you don't have to do anything, a rental service is available to give you a quick return on investment when you do not occupy the premises (taxable at source). Up to 5% depending on the type of accommodation **. Description : Currently under construction in Grand Baie, this prestigious complex combines several types of high standard villas. Being an environmental-friendly concept, the villas have been designed taking great care of environmental aspects and will propose exceptional services. Delivery is scheduled for 2017 and 2018. The Clos du Littoral II which joins together 4 models of very high standing villas in an entirely secure environment in favor of green areas, swimming pools and private gardens. Based in Grand Baie, seaside resort of the island, the access to the site will be easy and near the town center and the sea. Boat parking places will be proposed for sale or to rent, offering an additional service to those wishing to enjoy the Mauritian lagoons. Owners will also be able to enjoy a reception and a superb tropical spa. The availability of a private beach entirely at “trou aux biches” attainable with a daily shuttle : kiosks, deck-chairs, waterfront massage and water sports are available. Additional services: A unique solution for the purchase, security, the maintenance and the launch of the boat. Available properties: 4 types of villas available all with private gardens and swimming pool. Description: In partnership with our partner TPG, we offer flats in a development program specifically designed for investors looking for a profitable and sustainable rental investment. Building on the dynamic tourism in Pattaya (each year 10 million tourists), the developer are vertically integrated manufacturer of the functions and hotel manager, developing a unique real estate business in Thailand. Strengths aspects: At 400 m of the beach. A Pratamnak, one of the most popular areas of Pattaya. Serviced residence (famous manager). furnished and fully equipped apartments. 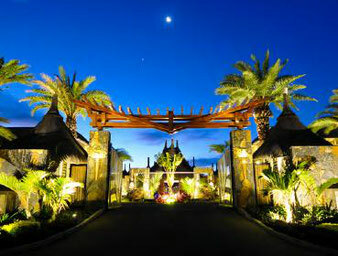 This private residence in Pattaya for 15 years used in 49 small buildings and villas. Rental guarantee: 10% / 10 years, monthly payment. Available properties: Several apartments available in different configurations and in different residences, fully furnished. Investment opportunity: Rental income of 7% per year over 5 to 10 years. Strengths aspects: Location of first choice in Phuket. Renowned real estate developer. unusual environment. Rental guarantee: 7% over 5 to 10 years. Freehold or Leasehold. personal occupancy 4 weeks per year. Available properties: More modern, spacious and fully furnished. Different surfaces available. Investment Opportunity: Return on investment guaranteed 4% over 5 years. Description: Luxury Serviced Apartments. Guaranteed Returned Personal Use: 4% return guaranteed for 5 years! More than just an apartment, More privacy than in a hotel. 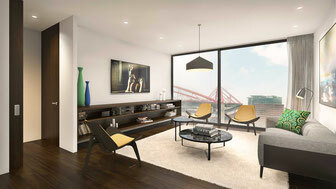 Benfica Stadium Luxury Flats great accommodation solutions for short or long stays. Each apartment has been designed to suit our guests needs, enticing them to make themselves at home. Perfect for working, resting and playing in you own private space. The apartments are fully equipped to best tour guests’ comfort. Strengths aspects: In the heart of Lisbon, excellent location just few steps from the Stadium "Estádio da Luz" and close to the places of business of the city, the project to all the assets from a business and tourist clients. The promoter at the head of the project is a leader in Portugal. Available properties: Apartments of one or two bedrooms, available in three finishes, fully furnished and a parking space. Description: Unique project, Villages Nature offers a new tourist destination perfectly suited to the expectations of customers: family fun, comfort, nature and ease of access. Initiated by two major players of tourism in France and Europe - Euro Disney SCA and the Pierre & Vacances-Center Parcs Group- worn by her ambition for sustainable development, Villages Nature is a new holiday destination for short and medium stays, European scale. Offering an innovative leisure offer, exotic and seasonally adjusted in the heart of Paris Île-de-France - the first world tourist destination with 32.7 million visits in 2012 - Villages Nature has, in fact, a unique potential with a wide tourists both western European, French and local: market research conducted in 2006 and 2011 by Oliver Wyman / Mercer concluded with strong interest from European tourists - families with children, young couples and seniors - for vacation concept combining nature, recreation, relaxation and reconnecting with his family, especially in key markets such as France, Benelux, the UK and Germany. 900 000 annual clients are expected to visit Villages Nature at the end of phase 1, which is expected to open to the public during the 1st half of 2017. They will be welcomed on an operating destination all year round, 7 days /7. 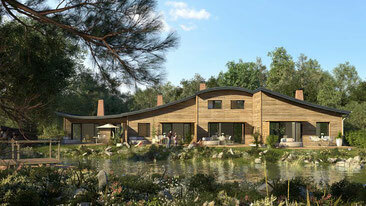 In the 180 hectares of Phase 1 - more than 90% will consist of open spaces - Villages Nature provides, within a natural environment of high quality, overlooking the forests of Crécy and Ferrières, 1730 luxury holiday residences (70% of cottages and 30% of apartments) and numerous recreational and relaxation facilities. The iconic destination equipment is Aqualagon, a pool complex of almost 12,000 m², consisting of one of the biggest indoor water theme parks in Europe and its adjoining outdoor lagoon, heated above 30 ° C through deep geothermal that can swim all year round. A Real "genius of the field ", geothermal energy can satisfy all needs heat Villages Nature (excluding maintenance and hazards). new solution in tourist operation on such a scale in Europe, the use of this renewable energy expresses the Villages Nature Trust a technology capable of reconciling aspiration as many leisure and vacation, and respect for the planet . Strengths aspects: Pierre & Vacances-Center Parcs and Euro Disney S.C.A. is an internationally known and recognized actor. Investment Opportunity: Return on investment of 7% annually. Description : With more than 150 universities and institutions dedicated to higher education, New York houses over 1 million students annually. According to the very officiates of the US. 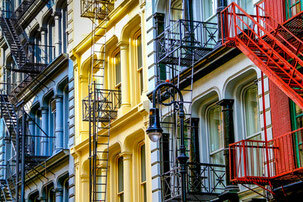 News and World Report, a student in the United States spends each year an average $9,999 for his or her housing. New York is the most expensive city in the U.S., and the average monthly rent is $3,783, according to The Council for Community Year of Economic Research. Student accommodation is therefore a market that is full of opportunities for investors worldwide. Uptown Manhattan is a neighborhood in northern Manhattan that has received extensive gentrification. Only a fifteen-minute subway ride to Times Square, Uptown Manhattan offers students a strategic location for their close proximity to their universities but also allows them to enjoy the life that New York has to offer. With expertise, our partner acquires buildings at competitive prices, renovating and landscaping them into student residences. By optimizing the surface and the management of these establishments our partner offers a key investment in hand generating 7% Annual Profitability to its investors. Strengths aspects: Free Investment from $ 100 000 for an initial period of four years, renewable six months before the deadline. Investment in one of the most dynamic cities in the world or the real estate prices are increasing. Investment in a growth market in student housing. Investment is secured by a security interest or mortgage security called Mortgage. Available properties: Several investments available in different student housing projects only located in Manhattan.